Although it’s copyrighted, watermarked, and not part of the officially linkable record, you can easily find at Flickr a public photo (not the photo on this page) showing Rochman in the belly of New Horizon. (Search for “SEAPLEX Chelsea Rochman” in Google Images). In the flourescent-lit oceanographic lab of the ship with its white walls beginning to chip and rust, she stands at a golden-varnished wooden lab table. In front of her is jumbled scientific equipment made of white PVC and translucent tubes, an open jar, a five-gallon orange bucket, and something — most likely trashy, briny, or both — unseen in four pieces of crinkled tinfoil. She wears blue lab glove. The sleeves of her black fleece are hiked to her elbows. Her forearms are tanned. Her hair spills over her face and sticks out like Medusa tentacles. On her face is a comfortable, sparkling smile. Studying garbage is her passion. Rochman is interested in how plastic litter picks up and transports chemical pollutants. It’s an unfortunate fact of chemistry that many kinds of toxic chemicals adsorb to plastic litter like iron filings to magnets. Plastic weltering in shore waters gathers its poisonous coating, and, transported by wind and currents, takes it on meandering journeys far out to sea. It ends in the unflushable slow stopped-toilet-bowl eddies of convergence zones such as the one in the middle of the North Pacific. In an August 16 SEAPLEX blog entry, Rochman explains how persistent organic pollutants, or POPs, can climb up the food chain in increasing concentrations. Like zombies converging on the farmhouse, they just don’t die and they’re bad news. POPs gather first in phytoplankton or krill, and, in all the slashing, biting, gulping, and digesting that begins in the ocean and ends in our tuna sandwiches, fish sticks, mahi mahi dinners, and sushi plates, the POPs ascend through linked chains of predators. It starts, when krill mistake toxin-coated plastic bits for food and eat it. Their bodies absorb some of the poison coating of POPs. Tuna eat the krill which have fed on the toxin-coated plastic. Then we eat the tuna which ate the krill which ate the toxin-coated plastic, and get an oral dose of flame retardant, pesticides, and other toxins. In any given ocean, predators (for example, tuna) have a higher concentration of pollutants per gram of flesh than do the organisms lower in the food chain. With each step up the food chain, measuring pound for pound of fishy flesh, the toxins become more concentrated. It’s a funnel of toxins pouring upward toward the meals eaten by top predators — us. As POPs accumulate in tissues of fish, or bird, beast, or human, they’re flushed out of the body only slowly, if at all. “Plastics do not biodegrade, they photodegrade,” explains Rochman in an August 9 SEAPLEX blog entry, “… the light does not degrade them away, it simply degrades them into smaller and smaller pieces.” The smaller the piece of plastic, the more efficient its role as vector of flame retardant into the fishy parts of your fish ‘n’ chips. That expresses the problem only in the most caddishly self-interested way, an appeal to the very lowest common denominator: what goes into stomachs. Obviously, there are more broader moral questions. Is it ok that our species has created gyres of plastic garbage and POPs in the convergence zones of Planet Earth’s oceans? In this two-and-a-half-minute professionally-edited video by Annie Crawley at DiveIntoYourImagination.com, see Rochman explaining her work on New Horizon. 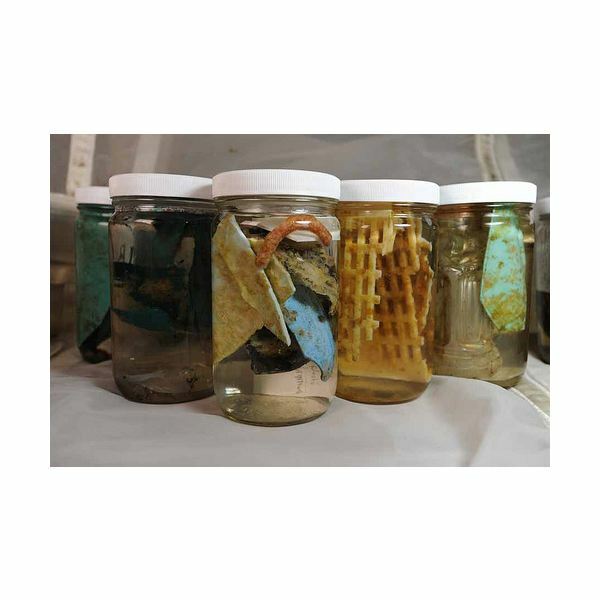 The Great Pacific Garbage Patch was discovered in 1997 by Charles Moore. Returning to California from a yacht race to Hawaii, he took a turn north to see a part of the Pacific he’d not visited, the North Pacific Gyre. What he found there — plastic for days, literally — shocked him. It led to a life’s work of studying, publicizing, and trying to solve the problem through his foundation, the Algalita Marine Research Foundation. The history of how the garbage patch was formed has a simple linear plot line, with a cast of billions of people, practically all of them unaware of their roles: Plastic is born as pellets manufactured from oil. These raw plastic pellets, called nurdles, are shipped to factories that manufacture plastic stuff. In one form or another, the plastic stuff is hauled to stores and manufacturing plants everywhere. We buy it, make other stuff with it, use it, throw it away, break it, tear it up, flush it, or lose it. Owing to weather and current, drainage and overflow, garbage management and lack of it, a not insignificant amount of plastic enters our oceans. Once in the ocean, wind and ocean currents move the plastic to convergence zones in the centers of oceans. Pete Davison, a Ph.D. student on New Horizon’s voyage into the garbage patch, is a balding man with a trim blondish goatee going grey at the chin. He has the face of a Harley rider and the arms of a lab rat. He has a tiny hoop earring and studies myctophidae, a family of deep sea smallish fish which constitute up to 65%, by some estimates, of Earth’s biomass. During daylight hours, myctophidae tend to hang deep in the gloomy water where predators can’t easily get a bead on them. At night they rise to feed on zooplankton and, if they live in a trash gyre, small bits of plastic. 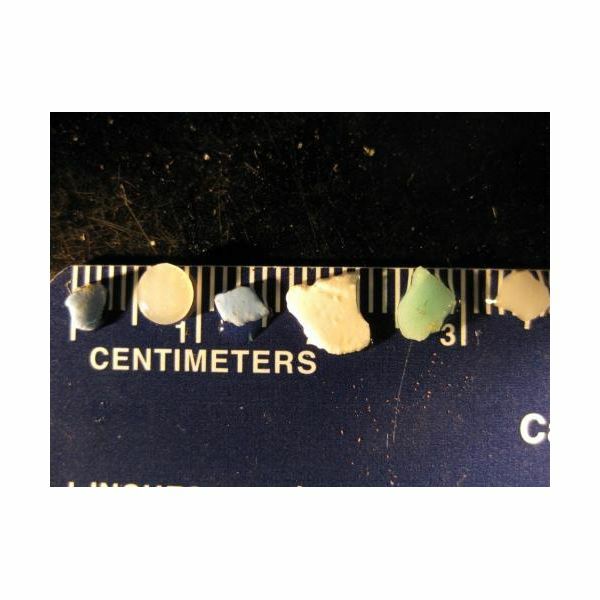 Based on the evidence we have so far, it seems that most of the plastic in the garbage gyre, broken into bits by sun and water, are quite small — say, around the size of a tidily trimmed pinky nail. Davidson joined the SEAPLEX voyage to gather data on how much plastic is eaten by myctophidae and to what effect. There’s a photo of Davison seated at another of those golden-varnished wooden lab tables in the research ship New Horizon. Looking past his right shoulder, his grey eyes are on the camera; the left one squints, the right one flares, as if to say, “Oh, I’m polite enough, but if you keep taking pictures while I’m trying to work, it’s all on you.” His right hand covers the computer mouse, evidently adsorbed to it. His frontal lobes seem to bulge through his impressive domed forehead; his left hand braces the intellectual’s flaccid bicep at the sunburn line. On the desk in front of him, a large laptop computer on the cluttered table. 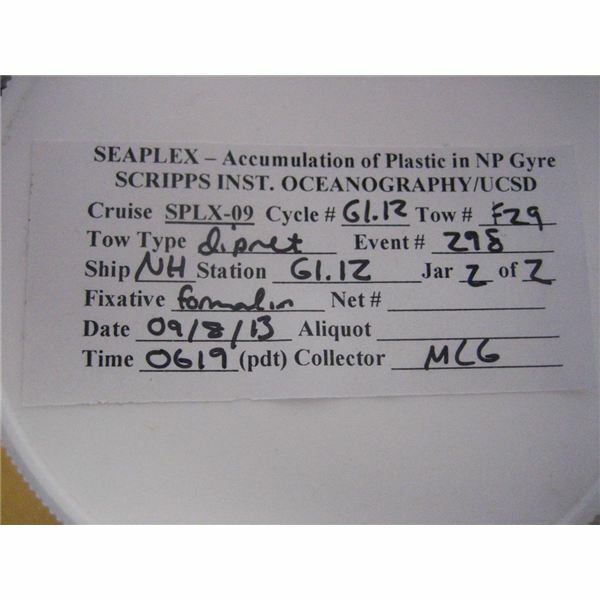 In a SEAPLEX blog entry of August 4, Davison explains how the North Pacific Gyre created, with our indispensable collective assistance, the Great Pacific Garbage Patch. The movement begins in air, he explains. A massive, climatic high pressure system towers over the North Pacific Ocean. Air flows outward from this high pressure system. But it doesn’t flow straight out; air movement at that scale can never proceed like ripples spreading outward. The rotation of the Earth causes the air to curl to the right, clockwise as viewed from space. This is the result of the famous “Coriolis Force” which you can see in a draining sink. It creates prevailing winds that circle the North Pacific. These winds push the water over which they blow, helping to create the prevailing ocean currents that also circle the North Pacific. These currents, themselves also subject to the Coriolis Force, curl rightward and more rightward, which brings them in long, gentle spirals to middle of the North Pacific Ocean. The water moving into the center has nowhere to go but down. So that’s where it does go. It sinks, leaving behind anything that floats, such as plastic. The sinking water, meeting the ocean floor, flows outward in deep currents, returning to the edges of the Pacific. Off the coast of California, for example, the deep currents well up ready to carry more garbage on its long spiral into the center of the North Pacific. How much garbage, really, is in the garbage gyre? To come to any reasonable estimates, some very smart people have to do a lot of specialized work. The SEAPLEX voyage spent $18,000 per day just to operate the ship New Horizon, according to San Diego journalist Eric Wolff, who has well-placed sources and is no critic of the SEAPLEX voyage. In fact, he’s decidedly friendly toward it. It’s a nifty ship, even at that price. New Horizon is 170 feet long and 36 feet in the beam. She has two 850-horsepower Caterpillar engines, a cruising speed of 10 knots, a fuel tank of 40,000 gallons of diesel, and can travel forty days and forty nights burning 1,000 gallons of fuel a day. She has 1,265 square feet of lab space and 1,730 feet of work deck. New Horizon can manufacture 960 gallons per day of fresh water from seawater. New Horizon can make 670 pounds a day of crushed ice. New Horizon has a small explosion-proof refrigerator. New Horizon: a Chuck Norris of research ships. All of which begs some obvious questions. At that expenditure of money and resources, how much do we really need to know about the garbage gyre? Can’t we just make a decision to keep plastic out of the ocean as much as possible? Do we really need further study of such an obviously bad and ugly thing as POP-contaminated plastic litter in the Pacific? Why not, rather, spend that cash on bling for prevention? For anyone convinced of the problem, it’s hard not to feel sympathy for the desire to take action, to do anything other than “further study.” But the qualifier is crucial: “For anyone convinced of the problem…” Just because some are convinced doesn’t mean others are. Or that they even know about it. With Darfur, global warming, and the worst recession since the 1930’s to compete for our attention, why should anyone put some “Great Pacific Garbage Patch” on their radar? Or, to ask an even more maddening, but necessary, question: why should anyone believe in the existence of a “Great Pacific Garbage Patch”? Scientific data is necessary. Critics might disagree with Wolff’s implication that the Algalita Foundation’s work is somehow not convincing enough. They might argue that spending $18,000 a day on more or better studies of the Great Pacific Garbage Patch is comparable to fiddling with test tubes while Rome burns. But here’s another inconvenient truth in a century already juggling too many of them — and it may be the most fundamental inconvenient truth of them all: taking action to solve any large environmental problem is not politically simple. It requires the cooperation not just of a choir of activists, but of fantastically large numbers of people, organizations, industries, and governments. Cleaning up, or even slowing, the pollution in the North Pacific (and, we might assume, many other oceans) is not simple — and it is not even politically possible — if the data is not solid. Furthermore, there’s the question of effectiveness of whatever cure may be administered. It’s hard to know if what you’re doing is effective without baseline data. It appears the SEAPLEX voyage will give us a little more to work with — another source of information about the Great Pacific Garbage Patch, and more rigorous data about the extent of the problem. What Does $18,000 a Day Buy On a Research Boat? Miriam Goldstein, lead scientist of the expedition and a Ph.D. student at the Scripps Institute of Oceanography, is a bubbly woman of 28 with short brown hair, a round face with high cheekbones and a bow-shaped smile. Explaining the goals of the voyage on a video at the Scripps website, her voice hovers in high full notes at the beginnings of sentences, and then spills out in a sing-song cascade of light crisp words. Standing above a long flat beach in a lively breeze, wearing an army-green t-shirt on which is screen printed a yellow cutesy cartoon trilobite, captioned "old school," Goldstein explains the goals of the SEAPLEX voyage: to gather objective baseline data about the Great Pacific Garbage Patch. How much plastic is there? What kind of plastic is it? How does the plastic impact the ecosystem? How are the small plastic particles distributed vertically? What kinds of organisms are living on the plastic? Are other pollutants transported by the plastic? Even a casual stroll through the SEAPLEX blog reveals something fascinating about scientific work: moment to moment, it looks like any other kind of work, but when one takes a step back, it is something utterly different from most other kinds work. The scientists use heavy shipboard equipment like laborers. They click and drag cursers, they hold whiteboard meetings and they write with pens and pencils; all of which looks similiar to the inside of any office. But in its organization and purpose, it’s something very different. The first, most obvious difference is where the scientists draw their fundamental motivation to do good work. They are not motivated, fundamentally, by profit or politics or even by altruism. In their work as scientists, they want to know the answers to specific questions. It is that simple. All of their hard work stems from their need to answer unanswered questions. They want to know in the only way it is possible to know the answers to such complex questions as “How much plastic is in the North Pacific convergence zone?” The second major difference is the means in which they utilize to answer their questions. They do not rely on anecdote, intuition, or common sense. These all have no standing in the science world. The only way to know if an answer is correct is with numbers and data. 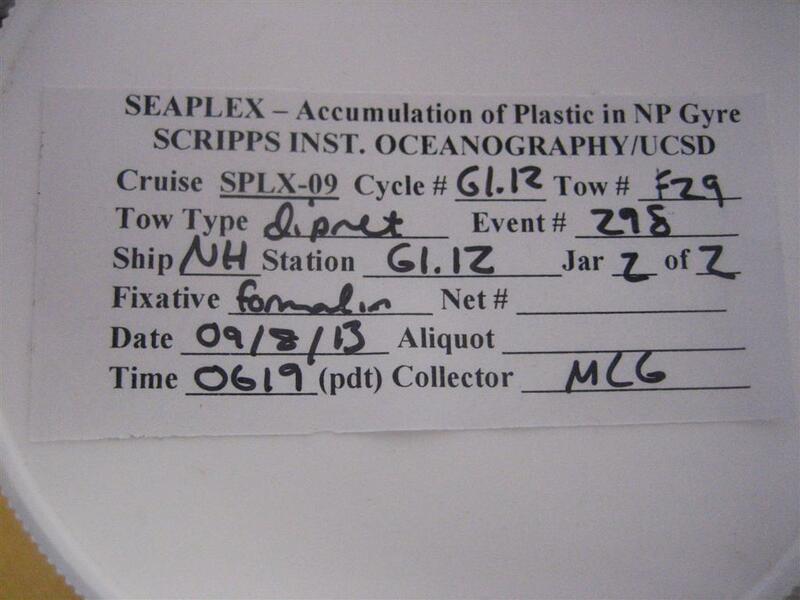 Jesse Powell in a SEAPLEX blog entry on August 14 describes how the team sampled a 100-square-kilometer section of the garbage gyre. 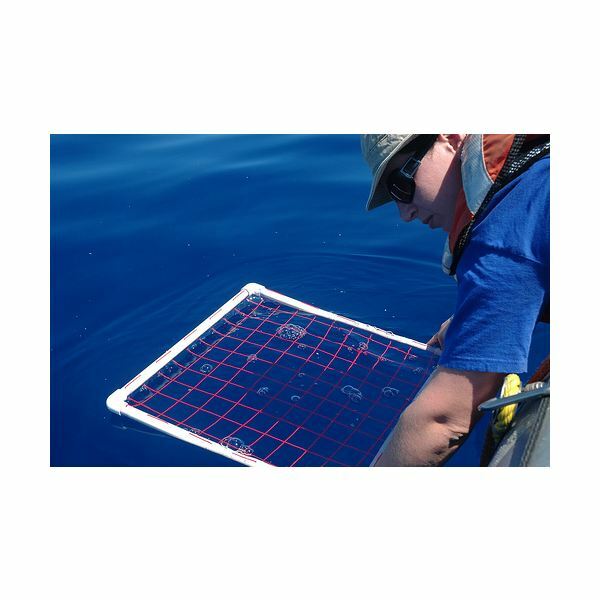 With a manta net, which is a large net designed to collect zooplankton and other minuscule items from the surface of the ocean, the team conducts sixteen manta tows plotted in in a 4×4, 10km x 10km array. This takes 20 hours. In addition to the manta tows, they conduct five “CTD” drops — one at each corner of the grid as well as one in the center. 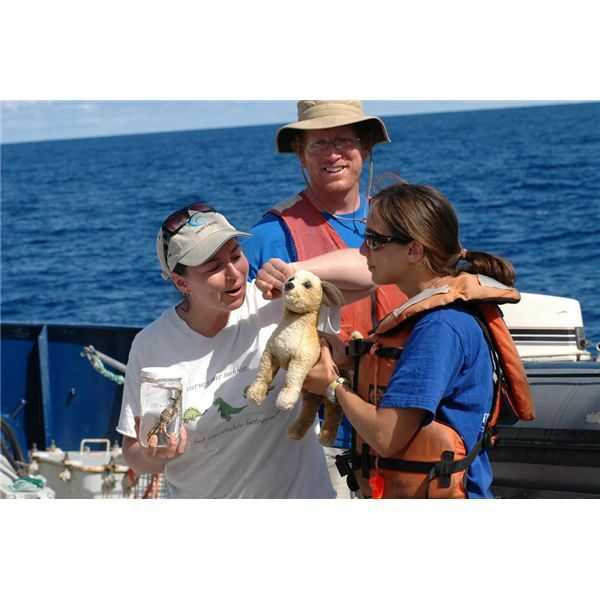 A CTD is a piece of equipment used to sample water at precisely measured depths. In a CDT, cylindrical containers are attached to a large metal wheel-like structure, together with conductivity, temperature and depth sensors. With the CTD’s cylindrical “bottles” open, this rosette can be plunged deep into the ocean. Then reeling it in, oceanographers remotely close the bottles at precise depths, thereby taking samples of water from exactly where they want. 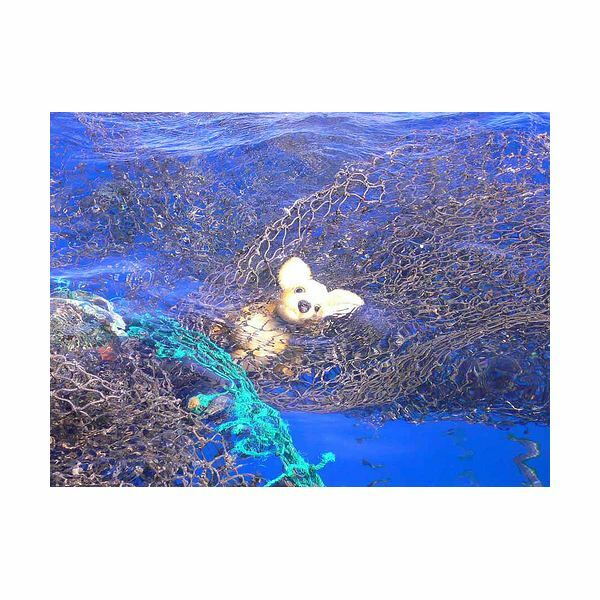 In addition to the manta net and the CTD, SEAPLEX scientists also used so-called “bongo nets” which sample zooplankton at depths to 200 meters, and an Oozeki midwater trawl, which samples squid, fish, and jellyfish at depths from 400 meters to 2,000 meters. Samples of all kinds — plankton, krill, fish, squid, plastic, barnacles, scale worms, crabs, sponges, flying fish, flying fish eggs, anemones, lanternfish, pearleyes, jellyfish, and more — were collected from the tow nets and the CTD and taken to the lab where team members painstakingly sorted, stored, and labeled them: Cycle #, Tow #, Tow Type, Event #, Station, Jar, Fixative, Date, Time, Collector, etc. 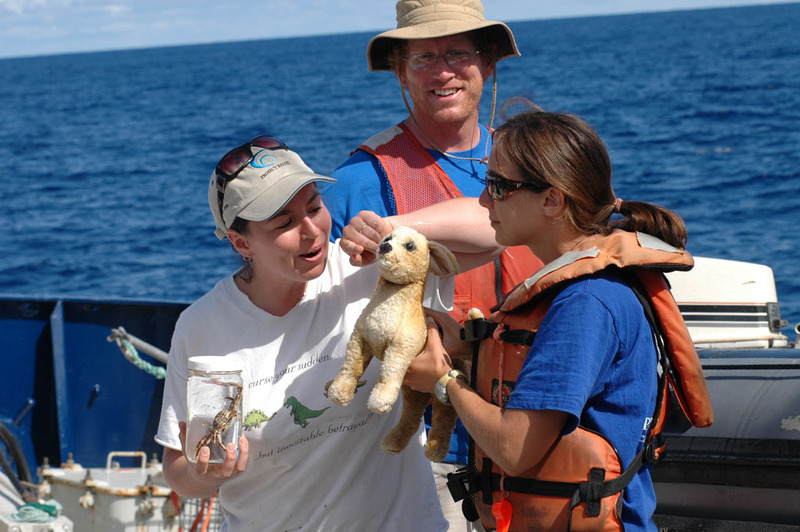 Now that the voyage is over, the samples and data will be analyzed, and more data generated and compiled and analyzed, to answer the basic scientific questions agreed upon in the planning stages of the voyage. This work will take some time. The SEAPLEX blog, with its vivid Pacific blue photos, informative videos, and charming mix of scientific reporting and warm humor, enthusiasm, and intelligence, continues with updates. https://mediabank.ucsd.edu/seaplex/origs/Pete-Large.tif Pete Davison in the New Horizon research lab. https://seaplexscience.com/2009/08/03/oceanographic-equipment/ New Horizon’s oceanographic equipment photos and descriptions. 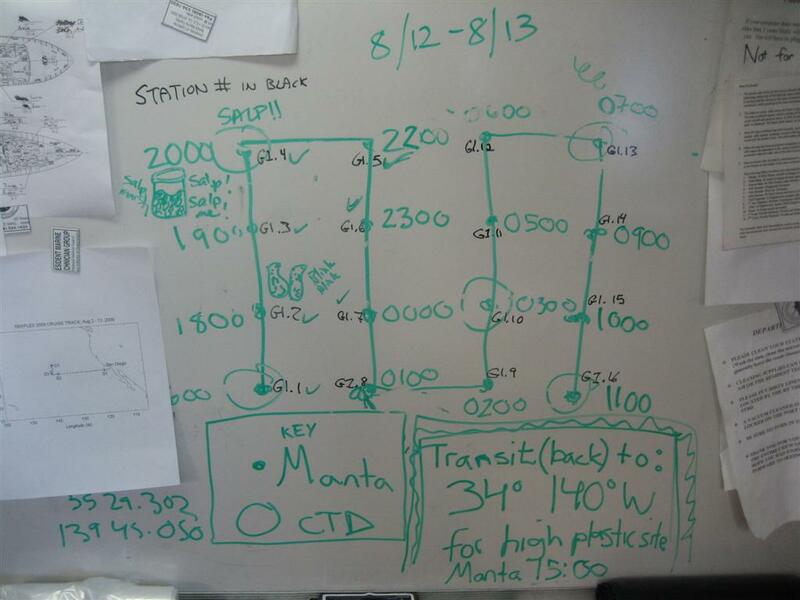 https://seaplex.files.wordpress.com/2009/08/grid-006-large.jpg The whiteboard plan for a single 20-hour regimen of sampling with the manta tow and the CTD. https://seaplex.files.wordpress.com/2009/08/label-8-13-09.jpg An image of one of hundreds of sample labels from the voyage.